The iconic Middle Temple has been awarded a wedding licence extension by the City of London. The Central London venue, already licensed to hold both weddings and civil partnerships in the Queen’s Room and Parliament Chamber, is now permitted to hold ceremonies in the impressive Elizabethan Hall accommodating up to 100 guests and Prince’s Room catering for 60 guests. The newly licensed rooms will be available for ceremonies from 20th April 2015. 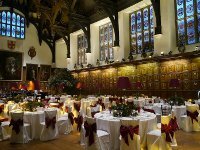 Built between 1562 and 1573 and combining stunning historic features and beautiful secluded grounds, Middle Temple provides the perfect backdrop for a dream wedding. Couples can now choose from a total of four striking spaces for both ceremonies and receptions. The Elizabethan Hall is a breathtaking space boasting an original double hammer beam roof, stained glass windows and oak panelled walls festooned with Coats of Arms. The Hall caters for between 80-300 guests for a wedding breakfast and up to 500 guests for receptions. Reflective of a grand country house drawing room, the Prince’s Room is ideal for receptions for up to 100 guests. With views across the River Thames, weddings and civil partnership ceremonies can be hosted in the Queen’s Room which can accommodate 50 guests or the Parliament Chamber which can accommodate 75 guests. Both the Queen’s Room and Parliament Chamber are ideal for intimate dinners catering for 22 and 70 guests respectively. Often described as a hidden gem, Middle Temple’s landscaped gardens offer the ideal spot to pose for photographs alongside the historic interiors which feature intricate carved woodwork and ornate cornicing. The garden can house a marquee hosting up to 1,000 guests. Middle Temple is steeped in over 400 years of history and has welcomed Queen Elizabeth I and II, William Shakespeare, Sir Francis Drake and Charles Dickens. The Hall is notable for many reasons, a few being surviving Civil War, The Great Fire of London and two World Wars.